Cute FTP Home 8 is ftp clients software developed by GlobalSCAPE Texas, LP.. Cute FTP Home is a utility for transferring files between your computer and a remote File Transfer Protocol (FTP) server anywhere on the Internet. It offers the perfect blend of ease-of-use and performance for the home or personal FTP user. Whether publishing a Web page, downloading the latest digital images, music and software or transferring large files between your home and office. Cute FTP Home will get the job done quickly and easily. This is a demo version of the program. In order to use full version features, please go online and order a full version of Cute FTP Home 8. The full version is available at regnow and GlobalSCAPE Texas, LP. website for $39.99. Cute FTP Home 8 supports different languages (including English, French). It works with Windows XP/Vista. Latest Cute FTP Home 8 does not contain any spyware and/or advertise modules, allowing installing it with no worries concerning valuable information loss. Our website has thoroughly tested network & internet product Cute FTP Home 8, written the review and uploaded installation file (4951K) to our fast server. Downloading Cute FTP Home 8 will take minute if you use fast ADSL connection. 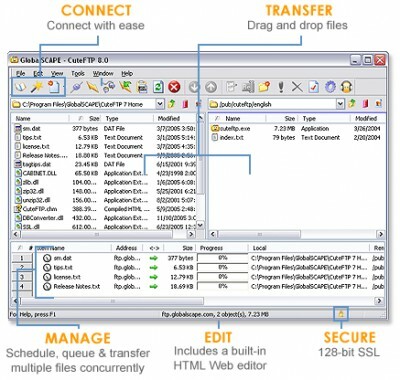 SimpleFTP gives you a file transfer program, modeled on the RFC 959 File Transfer Protocol (FTP) Internet standard, that emphasizes simplicity and ease of use.